On an evening in the summer of 2009, I was picked up by Norberto, a friend I had met during ethnographic fieldwork in Cuenca, Ecuador. Since it was my first time in his truck, Norberto showed me how he drove solely with his hands by braking and accelerating with his thumbs through the steering wheel. “Mira (Look), I don’t need my legs at all,” he laughed. When we arrived at the Coliseo Jefferson Perez, the main indoor arena in Cuenca, for his basketball practice, Norberto greeted several men who joked around as they lifted themselves out of their vehicles and into their wheelchairs that were stored in back seats or truck beds. A taxi pulled up to the front entrance and out came Enrique, a well-known panhandler in downtown Cuenca who was born without feet. He maneuvered his way into his chair and rolled alongside his teammates. Norberto ushered me toward the front entrance of the building. “Achachay,” he said, noting the damp chill. Achachay is a Kichwa term Cuencanos reflexively utter when the sun dips below the mountains. Through my observations and participation in this weekly wheelchair basketball practice, I gained insight into how technology becomes deeply intertwined with everyday embodied experience among people with physical disabilities in highland Ecuador. While these athletes came from different socioeconomic and professional backgrounds—they were an appliance factory technician, a photo store owner, a fast food worker, a street entrepreneur, for example—the camaraderie they shared as competitive athletes following recovery from a serious injury cut across ethnic and class boundaries. Most striking was how their athletic performance signaled a particular type of masculinity through engagement with new technologies and bodily practices. Wheelchair sports provided an outlet for these athletes to demonstrate their masculinity by aggressively competing against and cooperating with other men. For me, the basketball court offered an intriguing site to explore how wheelchair athletes reconfigured the capabilities of their bodies. To make sense of the complex journey that these disabled wheelchair athletes experience, I draw on Lenore Manderson’s (2011) concept of “rehabituation.” In place of a medically-oriented framework of rehabilitation, Manderson argues that people forge new types of embodiment that involve the “recreation of habitus” following the bodily disruptions of disease, injury, or loss of limbs (2011:96). Habitus, which refers to skills, habits, and practices anchored in the body (Bourdieu 1977), is particularly useful in understanding how people who have experienced bodily disruptions craft new embodiments. Habitus is acquired through learning, exists beneath the level of discourse, and varies by social location (Wacquant 2011). In contrast to the way that conventional forms of rehabilitation tend to privilege repair of body parts or emphasize psychological recovery, turning toward habitus and habituation encourages us to think about the tactics and practices people draw on to inhabit their everyday worlds. In my research, I show how newly formed embodiments are shaped by subjective experiences, locally available knowledge about impairment, and broadly shared interactions with the built environment. In this post, I consider how processes of rehabituation reflect new enactment of gender roles as well as shifting relationships with technology. These athletes challenge the popular beliefs that disability is inherently emasculating in part by reformulating their identity against normative meanings of manhood in Ecuador. Thus, the concept of rehabituation helps account not just for individual responses to injury, but also for how people internalize existing social beliefs about the body. People I spoke with said that interactions with medical institutions played a minimal role in their processes of recovery. Many had no formal diagnosis and received little or nothing in terms of financial compensation or support. Rather, the new skills they learned to deal with their bodily disruptions (e.g. using a cane, prostheses, or assistive technology) were acquired informally at disability organizations or through friends with similar experiences. Collectively, these athletes help us understand how communities of people with disabilities in highland Ecuador strive not only to imagine new social formations, but also to draw on technological resources to transform their bodies and the materiality of the world they inhabit. On the same evening in Cuenca, I chatted with athletes as they prepared to practice. After entering the arena by wheeling across a makeshift ramp comprised of a heavy board laid across steps leading down to the court, a few men wrapped their hands with athletic tape. Others heaved themselves out of their “everyday” wheelchairs and into their “athletic” chairs. Before entering the court, each player strapped a thick band across their lap designed to prevent them from being thrown from their chair—which worked most of the time. (I later learned that these specially adapted athletic wheelchairs had been donated gradually over a period of five years from various organizations in Colombia and the United States.) They began to stretch, pivot in their chairs, pass, and cajole each other to take shots at the hoop. The athletes ranged in age from those in their early 20s to their 50s with varying levels of ability to push and dribble. I learned that while most had recovered from some type of spinal cord injury, others had congenital impairments. People with no physical impairments also participated at times, such as the players’ sons or friends—I got a chance to borrow a wheelchair and play a few times when an extra player was needed. As I learned about the lives of these athletes, people often discussed the aftermath of serious injuries or impairment and the ways they reinvent and internalize new ways of acting, feeling, and moving. The new orientations ranged from adjusting to using a wheelchair or walking aid in the streets to profound shifts in being interdependent with their wives or children. As I engaged in wheelchair basketball, as an observer and as a player, I witnessed traces of bodily training and reorientation both on and off the court. Playing a sport like wheelchair basketball requires a complex coordination of bodily practices that cannot be easily emulated. In addition to the difficulties of shooting, passing, and dribbling while simultaneously pushing a wheelchair, rules and strategies particular to the sport make it difficult for novices to master. For instance, legal forms of “dribbling” entail either bouncing the basketball next to one’s chair, or taking no more than two pushes with the ball in the lap. 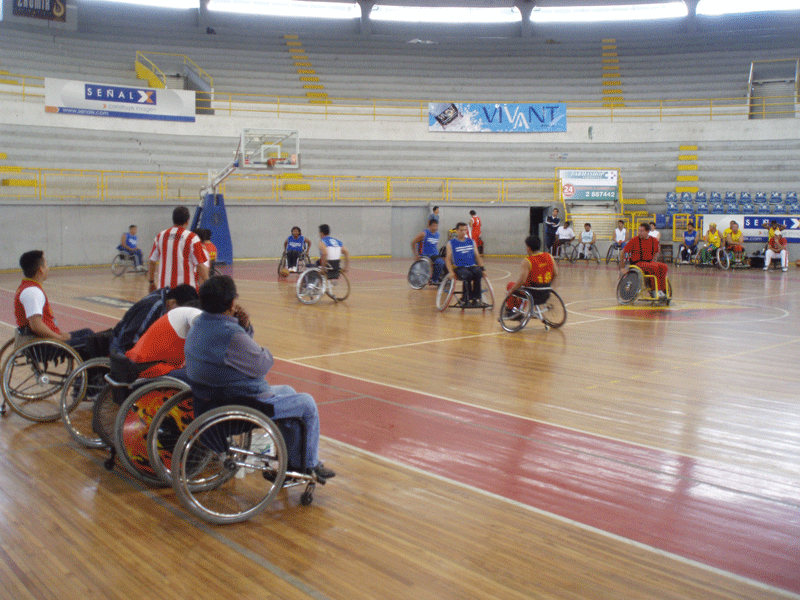 Although a few athletes occasionally received formal instruction from their involvement in Ecuador’s national wheelchair basketball team (la selección), for the most part the players from Cuenca learned through sheer effort on the court. How do these Ecuadorians relate to their bodies after becoming involved in disabled sports? While wheelchairs are sometimes conceived as a bulky form of adapted technology, the phenomenology of wheelchair sports helps illustrates how deeply people with mobility impairments can become intertwined with their wheelchairs. The notion that wheelchairs can be conceptualized as something more than simply tools became clear when I spoke with Francisco, a laid back younger member of the basketball team. While his natal family played a key role in his initial recovery, the basketball team became his most important social network. Over beer and plantain chips, Francisco described how he worked as a miner in a rural province of coastal Ecuador when his accident occurred. His team was drilling for a vein of gold with a massive drill when a two ton slab of rock fell from the roof and crushed his legs. Francisco’s story touches on the social dimensions of his experiences of rehabituation. After a lengthy (and costly) period of recovery in Cuenca, Francisco eventually joined the wheelchair basketball team. He called it the “best form of therapy,” and credited it with helping him recover physically and psychologically from his injury. “The wheelchair is our life now,” he explained, “and the chair is our feet.” Francisco suggested that his experience of being in the world was mediated almost entirely through his wheelchair. He did not feel that he “transcended” his impairment, but rather revalued his own body in different ways. Physically, he had developed the strength and dexterity in his arms to lift his body weight into his car. The way that wheelchair technology becomes embedded into the way that these athletes train their body speaks to what some disability theorists have posited as the “corporealization of the cyborg” by way of a non-traditional embodiment (Kuppers 2000). In these narratives, athletes appropriate wheelchair technologies as their habitus is continuously altered. As wheelchairs become integral parts of their lives, many of the people I met conceive of personal success in terms of recovery, not in terms of rehabilitation. The sentiment among the athletes I met was that while rehabilitation requires some relationship with health professionals, their goals focused more on social participation through new ways of being in the world. Recovery meant the ability to participate in certain spheres of life—going to church, holding paid employment—but with a new orientation in terms of how they relate to their body. Speaking in general terms about recovery, my interlocutors suggested that successful adjustment occurs when people discard their prior modes of bodily practices as people capable of walking. For wheelchair basketball players, their ability to use adaptive technologies is linked to their performance of masculinity. Like his peers, Francisco relished opportunities to show how disabled Ecuadorians were capable of fulfilling social expectations of masculinity. He joked about how he measured up to other disabled men based on his athletic prowess as well as his ability to maintain paid employment in a factory (that makes industrial kitchen equipment). Francisco explained that describing his ability to play competitive sports dispelled commonly-held beliefs of non-disabled people about the limitations of having a disability. “I met one person who was sure we were going to kill ourselves,” he said me with a measured grin, “and others who are scared to death that we’ll hurt ourselves, but we fall and we get up.” Francisco felt that the confidence gained through the physicality of playing basketball had encouraged athletes to venture out into clubs, restaurants, and parties in Cuenca. Like disabled athletes I’ve met in other parts of Ecuador and the United States, these athletes challenge the idea that they are fundamentally different from other athletes. Garland-Thomson (2007) suggests that stories of disabled athletes offer counter-narratives to “personal tragedy” or “pity” themes in popular discourse. In analyzing how male athletes make meaning of their roles on the US Wheelchair Rugby team portrayed in the film Murderball (Shapiro & Rubin 2005), Garland-Thomson calls our attention to the “ultra-masculinity” performed by men with ideal bodies for the sport, with a storyline that “disability can provide a meaningful life in which ones thrives rather than languishes” (Garland-Thomson 2007: 115). While such storylines can be misleading in that they offer simplistic explanations for what constitutes a meaningful life, most of the basketball players I met subscribed to the idea that playing sports enabled them to challenge the expectations of people around them. Yet is it also important to consider the ramifications of naively celebrating recovery of masculinity among wheelchair athletes. As other scholars have pointed out, we risk leaving the heteronormative masculinity of these spaces unexamined (Barounis 2009). While these are open research questions, it was clear how wheelchair technology played a key role in defining what it meant to be a disabled man. A few months after my first encounter with wheelchair basketball, Norberto shed light on a different domain of adaptations to his spinal cord injury: the architecture and daily practices in his household. Medical models of rehabilitation often neglect the role played by environmental factors in producing disability. Approaching disability from the perspective of rehabituation orients us toward how people create habitable spaces at home. Another member of the basketball team, Norberto, gave me a tour of his family’s farm and the new house he was in the process of constructing. It represented the culmination of his vision for living on his own terms: accessible design, family-oriented, and mostly self-sufficient. Norberto pointed out the fruit trees and creek running through the back yard, mentioning that unlike the house he inhabited as a child, this house would have electricity. What Norberto really wished to highlight were the modifications he had planned and implemented. He pointed out the accessible features of the house: zero-grade entrances, wide bathroom doors, and a generally open architecture that would make using a wheelchair much easier. Remittances from an older brother working in the United States had also helped him pay for his truck, and being able to drive enables Norberto to deliver wooden figurines that he sells in the tourist market in downtown Cuenca. He had improved his quality of life considerably by designing a more inclusive home environment that was easier on his body. Rather than emphasizing conventional notions of rehabilitation, Norberto’s narrative demonstrates how a new sense of self emerged through creatively using assistive technologies and reorienting his life toward physical health. Norberto characterized his family as campesinos, indicating that their household income mainly came from farming (in addition to remittances). In relation to the fairly rigid social hierarchies of race, class and patronage that have been documented by anthropologists working in Cuenca (Miles 1991), Norberto had minimal palancas, or social ties that would enable upward mobility. Limited income led to a gradual, piecemeal construction of his new house unaided by architects and carried out by family members. His socioeconomic status placed in the middle among the wheelchair basketball players, which ranged from one player whose family owned several businesses in Cuenca to Enrique, the panhandler who lived in a remote, modest dwelling. Beyond changing ideas about masculinity, there are larger social dimensions at play that extend this discussion about habitus into social constructions of disability in Cuenca. Playing sports in public has gradually improved the image of people with disabilities, according to Norberto, who explained that team members have been seen in the local newspapers and occasionally are recognized on the street by strangers. Norberto links increased public awareness to the change in attitudes that he has seen in the last fifteen years. Whereas fifteen years ago people would offer him unsolicited money on the street, in recent years they tended to treat him with more respect. The new world he envisioned depended both on learning new habits but also a new orientation toward living in the city. Whereas at first he railed against taxi drivers that would not pick him up or security guards that prevented his entry into bars or restaurants, over time Norberto and those in similar circumstances agitated against what they perceived as unjust exclusionary practices, a theme I have explored in more detail elsewhere (Rattray 2013). Disabled athletes and a handful of other disability activists have taken it upon themselves to directly challenge what they perceive as a system of able-bodied privilege in Cuenca. Considering how people in Cuenca proactively shape their environments in ways that accord with new forms of habitus offers an intriguing example for medical anthropologists studying disability and embodied differences. I argue that disabled people have been highly proactive in using technical adaptations and deliberate strategies to impact the social construction of space in Cuenca. By sharing tactics of recovery and strategies for disrupting the dominant conventions of able-bodied spaces, wheelchair athletes have attempted to alter perceptions of disability and gender. Ethnographic observation can help illuminate some of these dynamics in ways that interviews or medical approaches to rehabilitation may not. I’m hopeful that the analytical flexibility of Manderson’s notion of rehabituation points medical anthropologists in novel directions, such as linking bodily difference to studies of urban infrastructure and new social movements. Rehabituation offers a powerful means to track the rippling effects of individual bodily disruptions in local worlds. Acknowledgements: I appreciate the wheelchair athletes in Cuenca who shared their stories and the basketball court with me. I’m also grateful for the insightful editorial work from Emily Cohen and Michele Friedner, as well as comments from Wendy Vogt. Barounis, Cynthia. 2009. “Cripping Heterosexuality, Queering Able-Bodiedness: Murderball, Brokeback Mountain and the Contested Masculine Body.” Journal of Visual Culture 8(1):54-75. Kuppers, Petra. 2000. “Addenda? Contemporary Cyborgs and the Mediation of Embodiment.” Body, Space and Technology 1(1): (refeered e-journal). Manderson, Lenore. 2011. Surface tensions: surgery, bodily boundaries, and the social self. Walnut Creek, CA: Left Coast Press. Miles, Ann. 2004. From Cuenca to Queens : an anthropological story of transnational migration. Austin: University of Texas Press. Rattray, Nicholas A. 2013. “Contesting Urban Space and Disability in Highland Ecuador.” City & Society 25(1): 25-46. Shapiro, Dana Adam and Henry-Alex Rubin (directors). 2005. Murderball. New York: Think Film, Co.
Wacquant, Loïc. 2011. “Habitus as Topic and Tool: Reflections on Becoming a Prizefighter.” Qualitative Research in Psychology 8(1): 81-92. Nicholas Rattray is a postdoctoral fellow in the Center for Health Communication and Information at the Richard L. Roudebush Veterans Affairs Medical Center. Trained as a medical anthropologist, his research examines the cultural dimensions of disability, space and embodiment in highland Ecuador. He is currently investigating processes of reintegration among U.S. military veterans with traumatic brain injuries and the provision of acute stroke care within VA clinical microsystems. Inhabitable Worlds is a series that examines the theoretical tools and approaches that scholars bring to the study of disability in the social sciences and humanities. It is edited by Michele Friedner (Stony Brook University) and Emily Cohen (New York University). Rattray N. “The Chair is Our Feet:” Imagining Habitable Worlds in Highland Ecuador. Somatosphere. 2015. Available at: http://somatosphere.net/2015/the-chair-is-our-feet-imagining-habitable-worlds-in-highland-ecuador.html/. Accessed April 20, 2019. Rattray, Nicholas. 2015. “The Chair is Our Feet:” Imagining Habitable Worlds in Highland Ecuador. Somatosphere. http://somatosphere.net/2015/the-chair-is-our-feet-imagining-habitable-worlds-in-highland-ecuador.html/ (accessed April 20, 2019).